Yes, right between the daily supplements and my current favorite cookbook are the first signs of spring! As we gather the feeder, the waterer and the organic scratch grain, I can already hear the peeping of baby chicks. Our local farm store carries some of the most popular breeds and we always pick up a few Buff Orpington babies. I love these golden beauties! Buff Orpingtons are originally from England. Bred by a gentleman named Cook who wanted a dual purpose bird. Before he came along, chickens were a bit on the scrawny side! He was successful first with a Black Orpington, followed by Buff and then other colors too. They were wildly popular! 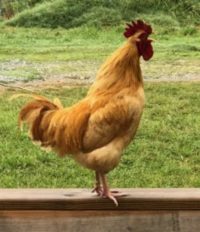 Our rooster Coop is a Buff Orpington! These are some of the friendliest hens you will find and the roosters are gentle. This is a great choice for families with kids because they “tolerate” children well. I chose them over 20 years ago when my boys were small. They wanted hens they could catch easily so they could hold and cuddle them. Our Buffs were always calm and friendly. These beautiful hens also give us big beautiful brown eggs almost daily! Unless running for food they just stroll around the farm like royalty. However, if the boys were tossing out scratch or other goodies, they could “hike up their feathery skirts” and run like the wind! Seems they did that very well down my aisles of tomatoes…taking one peck out of each beautiful red globe! Well…no one is perfect…. I also loved the Buffs because the “broodiness” hadn’t been bred out of them. When a hen “goes broody”, she sets on a nest of eggs to hatch them and will raise the babies. They are very good mamas. One of the best sounds in the world is a mama hen cooing and clucking to her little ones. It’s one of the most calming sounds on the farm. Hhhmmm…wonder if there is a sound track for that! I love to see them riding under their mama’s wings…never have figured out how a hen can carry 6 or 8 babies and you can’t even tell they are there! The chicks are yellow in color. Buffs are very cold hardy which is a plus here in Tennessee! We have crazy weather and you never know what you will wake up to. For instance, day before yesterday it was in the high seventies, windows open, front porch sitting, warm spring breezy and beautiful! 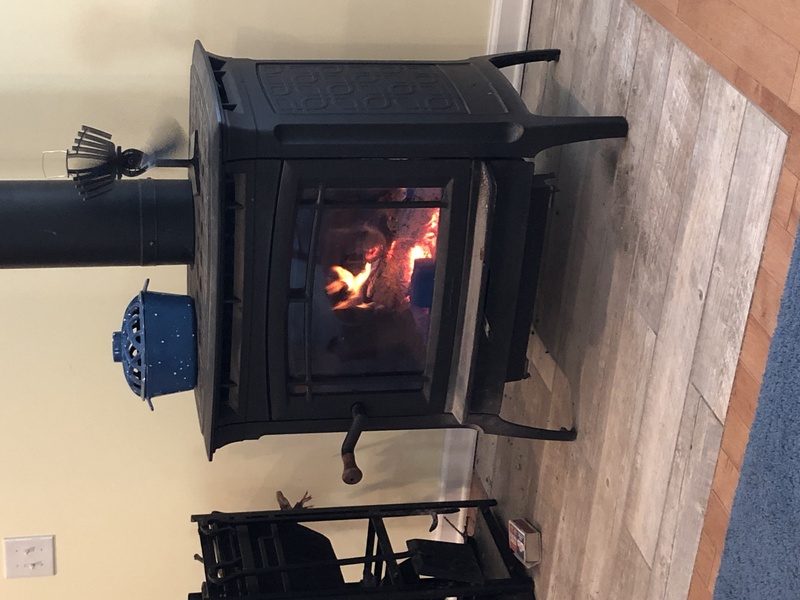 We are now in the midst of Dogwood winter (yes…here in Tennessee we name our “extra” little winters by the plants that are in bloom when they hit…we’ve already had red bud winter!). 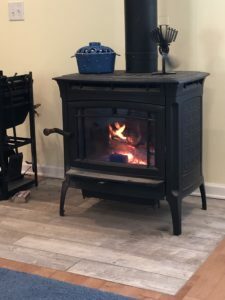 I’m writing this in front of the wood burning stove as the wind whistles outside and we are expecting a low of 38 tonight! Toasty warm in the middle of April! We keep our babies in a brooder box that my sons built. When they are big enough We will move them to an outside pen for their protection at night but they will be free ranging all day. Chickens have personalities (don’t ever let anyone tell you they are stupid or boring!) . 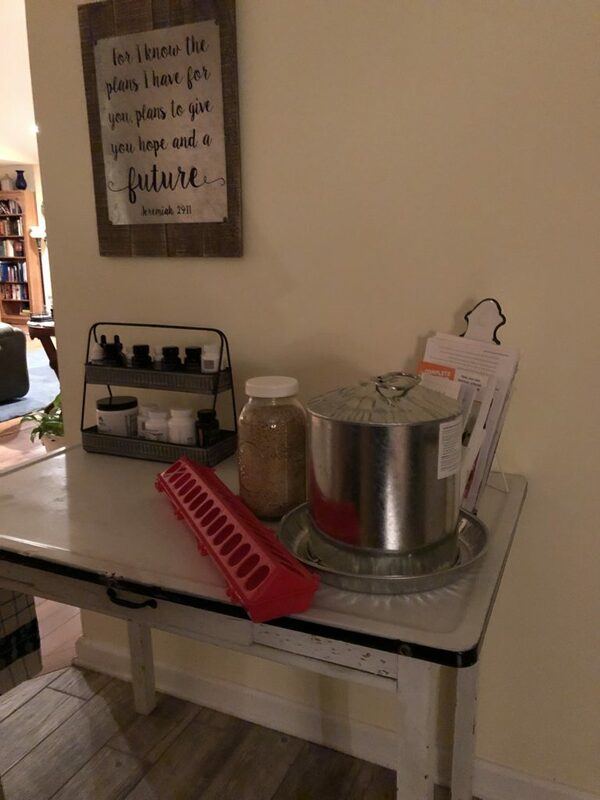 You never know what your chickens will do…or where you might find them! 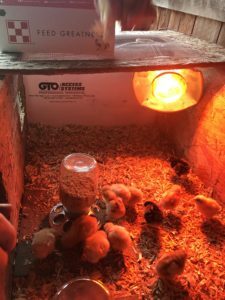 Our brooder box has a red lamp for heat but there is plenty of space behind it for when they want to “cool down”. 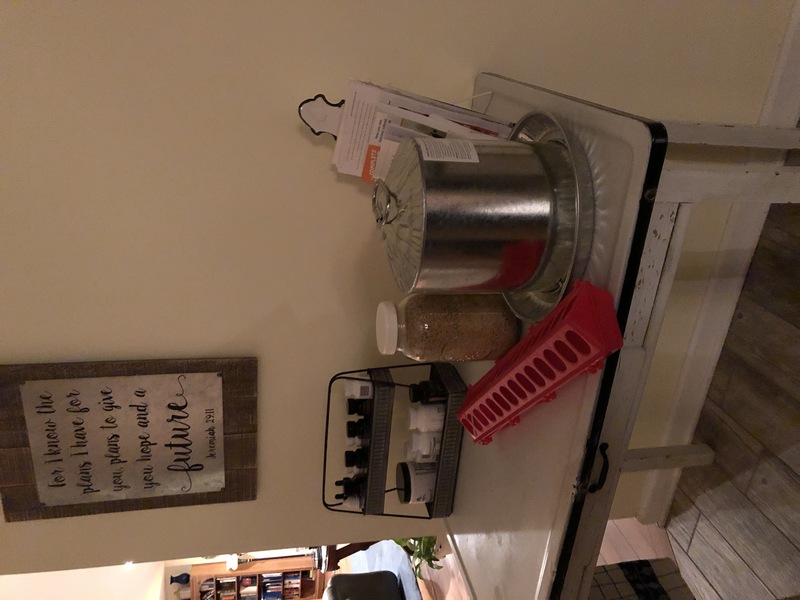 Some wood chips on the floor that are cleaned out regularly, some organic crumbles for chicks and clean water with a tiny splash of Apple Cider Vinegar to aid digestion and boost their immune system are all they need. Plenty of ventilation is a must too! 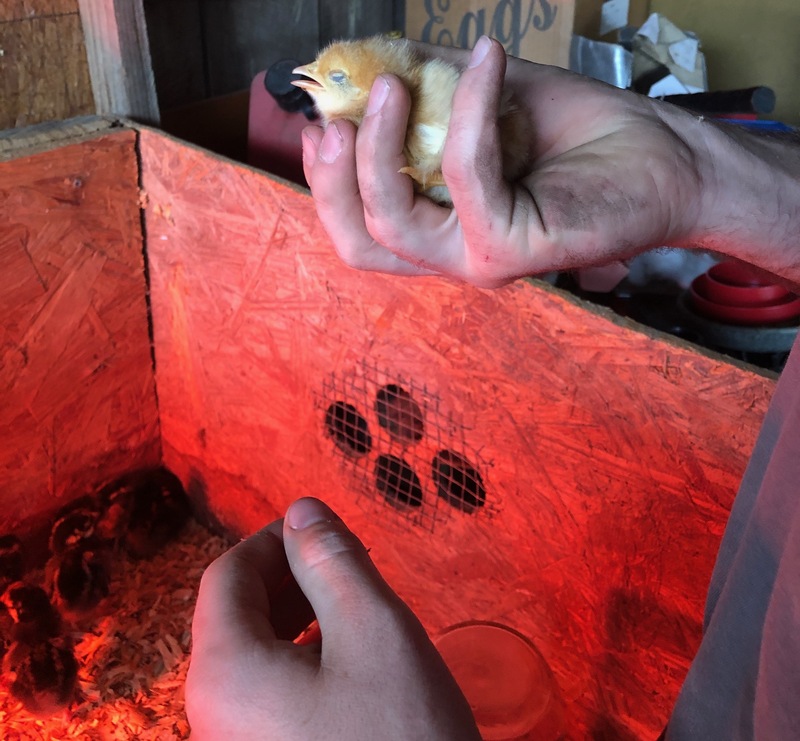 I’ll share some pictures as they grow…before you know it all of our winters will be over and they will be free ranging in a protected pen outside! Comment below and tell me what YOUR favorite breed of chicken is…and why!